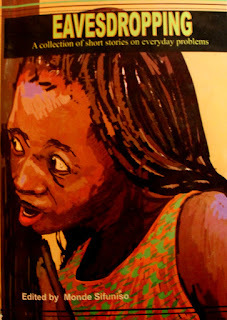 *This article was first published in the Bulletin & Record Magazine, Zambia in 2012, since then, the Yombwes' Wayi Wayi Art Studio and Gallery has grown from strength to strength. It now runs an international artists residency and has received to Artists-in-residence from the USA so far. The art classes and educational tours are booming and it is a must see art spot when you are in the town of Livingston in Zambia. The residency at Plot 2613/392 off Airport Road in Livingstone is not your average household. The lady of the house, Agnes often carries a paintbrush in one hand, a cooking stick and ledger book in the other. Husband, Lawrence, a philosophical thinker, reluctant poet and prolific painter often spends long hours dabbling paint on canvases. Daughter, Yande, a school-leaver, designs her own earrings and has a passion for deejaying where as younger brother Kondwani likes fast cars with loud stereos. Meet the Yombwes. A creative couple who form a husband and wife tag team of artists and their equally creative 17-year-old daughter and 15-year-old son. 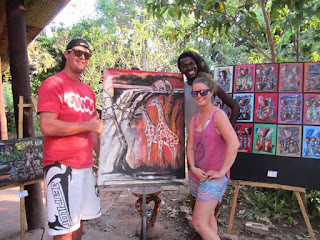 Having lived and worked as art teachers in Botswana, they returned to Zambia five years ago and decided to set up house in Livingstone calling their home and business premises the Wayiwayi Art Studio & Gallery. Although, still enthusiastic, the couple bemoans the seemingly feeble arts and crafts market despite having settled in the country’s tourist capital. Not only do the Yombwes use their home as a studio space to produce their own artistic work. It is also the venue for arts workshops open to schools, colleges and the public, which they say are not happening as frequently as they hoped for. The couple intends to expand Wayiwayi by building a classroom, storage shed, a pottery kiln and sleeping quarters for local and foreign visiting artists. However, with sluggish business resources remain insufficient. They are reluctant to approach the banks with fear of losing their property against a loan agreement, and attempts to obtain foreign grants usually come with unfeasible terms of disbursement. “Donors have the opinion that we are not ‘needy’ and so we do not need support. A Dutch organisation visited and told us we have to be a cooperative or group of 10 to be eligible for a grant,” adds Lawrence. In addition, he says although business has been slow, it has been steady. Agnes agrees that while business is slow there is hope for growth despite imitations of African crafts from China flooding the gift shops. She only hopes there could be a way that such goods could be regulated because she creates earrings, necklaces and beadwork to keep the family financially buoyant in between contemporary art exhibitions and commissions. She says projects such as Wayiwayi do have a lot of potential with proper public and private support and she feels it will be around for a long time to come. “Wayiwayi is here to stay. I do hope it is something that will continue with the kids. At least, Yande helps with the workshops and she even had a division one in art. But I don’t know about Kondwani when you ask him he jokingly says when his time comes I will break down a few walls and turn the studio in to a car show room” she jokes. Slightly bashful after her husband declares her ‘superwoman’, Agnes says like most women she occasionally sits down to enjoy a good soap opera, and the beauty about them is that they are easy to catch up with even after missing a few episodes. “As a family we also sit together to sing, pray and share bible passages, at least once a week. When we are not too busy we do it every day, “she says revealing the family’s religious side. “Whoever went to church on Sunday shares the day’s sermon with those who did not. We also have another day where we all review the week,” interrupts Lawrence “I cannot afford to give my children everything but I can afford to find time to at least listen to them, even just for an hour”. Little did the couple know, that the rich, traditional marriage initiates’ rites of the Mbusa ceremony that they underwent the night before being pronounced husband and wife in 1991, were to change not only their lives, but also their art forever. Agnes and Lawrence’s artistic styles vary significantly without one openly imitating or influencing the other. And although traditionally they are not supposed to share the secret symbols and hidden meanings of the Mbusa practiced by the Bemba in Northern Zambia, the couple have continuously borrowed from it over the years. Therefore, the multi-coloured lines, dots, pottery and mixed media that weave a tapestry of secret codes that help mould young men and women into responsible citizens dealing with topics such as gender, respect, hygiene, tolerance and love manifest in the works of both artists. Where Agnes is more of a gender and child rights activist in her works with titles such as “Stop Child Defilement” and “Polygamist”, Lawrence often explores political thoughts and social arguments and in his recent solo exhibition, he interrogated homosexuality in his work from the ‘corruption’ series, a topic not too many Zambians are comfortable talking about. Nevertheless, the couple remain among the most emulated and prolific artists of their generation. Agnes was born in Mazabuka in 1966, far from her Tumbuka homeland in the Eastern Province. She obtained an Art Teachers Diploma from the Evelyn Hone College where she met Lawrence in 1988. She also has a certificate of art and design from the Wimbledon School of Art in London, attended residencies at the Edward Munch Studio in Norway and the McColl Centre for Visual Art in the USA. Along with her husband, she is a founder member of the Visual Arts Council and served as treasurer and coordinator for women artists’ workshops. Lawrence was born in Kalulushi, in 1958. 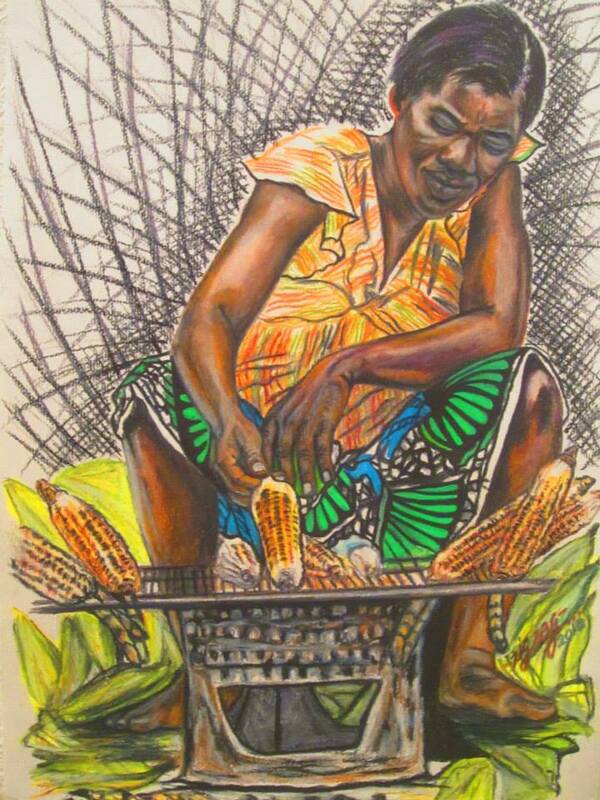 He studied for an advanced certificate in Fine Art from Croydon College, joined the Ndola Catholic Diocese as a graphic artist and later attended Evelyn Hone College obtaining an Arts Teachers Diploma in 1990. He attended a short arts administration course the the USA before establishing the documentation centre at the Henry Tayali Gallery, where he also served as VAC vice-president. When he was a teenager, his mother jokingly nicknamed him Zigzag, because of his meandering personality. He was into everything; he was on his school’s football team, basketball team, in swimming, as well as the drama and culture clubs. 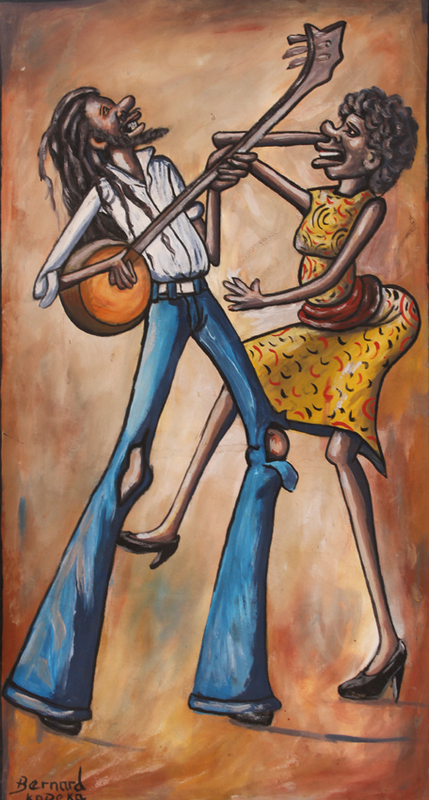 At some point, he was even the leader of a reggae band, but it is in the visual arts where Mr Samuel Nawa would seemingly settle his restless vitality. But even here the character of his technique is still true to the nickname that stuck on him by which everyone still calls him today. The themes of Zigzag’s art meander from social commentary, portraiture, landscapes, wildlife as well as none-representational abstract and political satire. But of late his work has assumed a snapshot, spur of the moment signature. 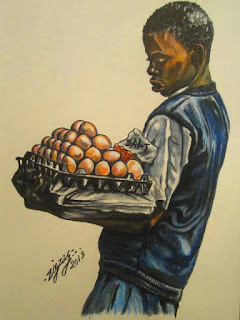 Notably in works where he passionately depicts everyday street people, particularly focusing on the vendors of such products as boiled eggs, plastic bags and roast maize. 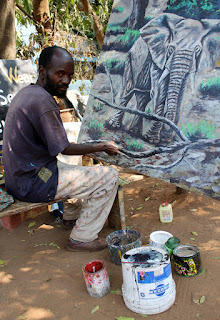 In Livingstone, where he has established himself as the resident artist in a very unusual setting at the Jolly Boys Backpackers, just next to the Livingston Museum, he freely paints in full view of guests and restaurant patrons, exchanging friendly chitchat while applies paints with to a canvas or doodles in a note pad. He believes mixing with people while he works makes the people part of the process, part of the art work, he is surely not the type of artist that will lock himself in a confidential studio for long hours. 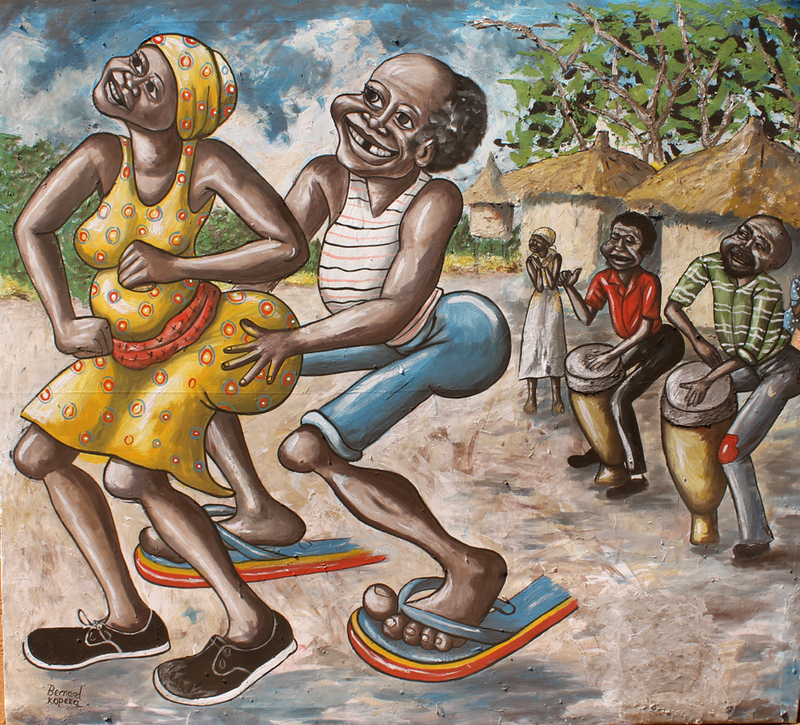 No doubt this positive energy provides an animated spontaneity that matches his snapshot style whether he is painting from a previously sketched street scene or doing something from the imagination or memory. These friendly customer relations skills also help pull in the sales and he never goes a day without a sale, the lodge’s gift shop too is filled with gift cards and book page holders that he created, the rooms too are decorated with his works and guests can purchase them upon request when they are checking out. But this is not his only point of sale, the tech-savvy artist also uses his Facebook page to advertise his work and he even ships as far as New Zealand and Canada. But life has not always been a joyful bliss for Zigzag, who is only in his late 20s, again true to his nickname; it has had its fair share of ups and downs. Early in his career as an artist he faced marginalization and subsequent rejection, but has never given up. 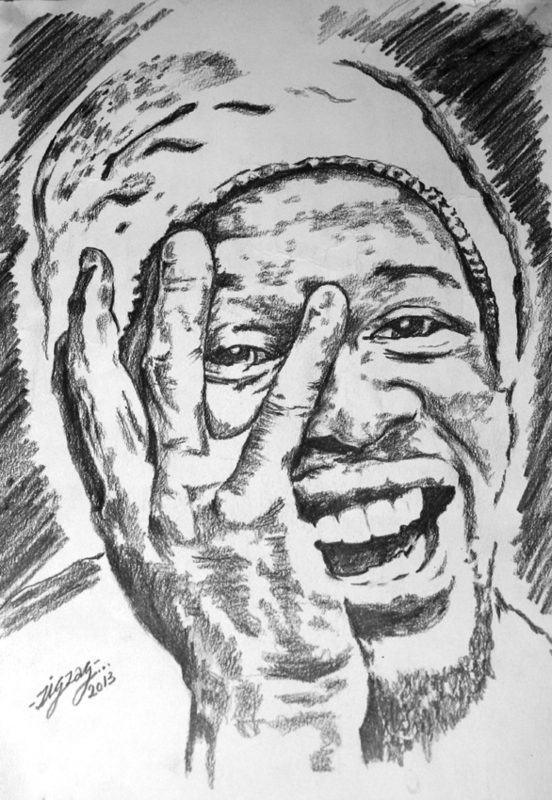 When he was only 12 years old, he had a burning to desire to launch his career professionally and his uncle took him to the Visual Art Council at the Henry Tayali Gallery in the Lusaka Showgrounds. “I went to see some art work with my uncle. I was inspired and wanted to join but they told me I was too young. I was told I was good but I was a kid, at the time I was at Jacaranda Basic School, I used to live at NIPA flats in the servant quarters with my parents,” recalls Zigzag. The house was so cramped he would have to paint at night when everyone was sleeping and at school during the day he used to draw comic books in exchange for exercise books or lunch, among his bestsellers were Duck Tales and the Ninja Turtles. “After a few years I met a girl from Canada called Ashley who introduced me to Twaya Art Gallery at the Intercontinental Hotel; they asked me for sketches and for my portfolio but I was about 14 years old, come on I didn’t even know what a portfolio was” he says. A year later, still determined, he tried to establish himself with a slot at Arcades Shopping Malls Sunday market, this is where he met the Lungu brothers from Mtendere, Jeff and Jim. 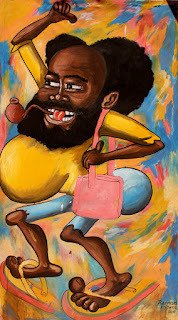 The brothers, although very active on the Lusaka art scene would bend the highbrowed gallery etiquette and sell their works curio-style in the mall parking lot. As much as the brothers inspired him, the young and restless Zigzag always dreamt of one day packing a bag and heading to Livingstone, to have a shot at the tourist capital. By the year 2000, he had already completed school and decided to travel; he had nothing but a bus ticket and a few clothes to change. “I had nowhere to sleep so I used to sleep on a bus, Bookers Express, so when the bus doesn’t come that night, I was in problems, I will be stuck and have nowhere to sleep,” he pays homage to the bus company in one of his recent works entitled Masuku for your journey, which depicts fruit vendors raising their baskets to the passengers for a purchase. “I tried to work with at the Mukuni Curio market but it didn’t work, I tried to work at the falls with my friend Luka whom I came with from Lusaka but it was tuff and he finally gave up and went back to Lusaka,” he says. He says at the time the Livingstone Visual Arts Council was very active, they had a lot of paintings at the museum but were not selling. 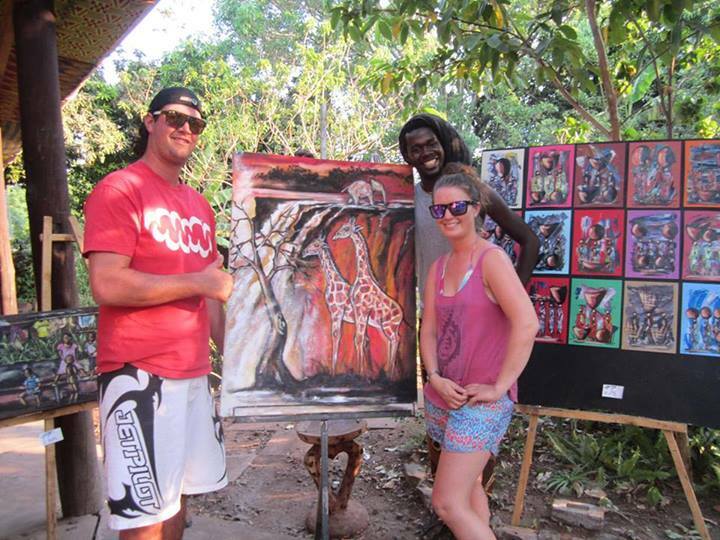 “I was then given a chance at the Arts Café being operated by a foreign couple Bob and Marylyn, and that is where I would end up spending most my time but they only ran it for three months because they were discouraged that the tourism season in Zambia is very short”. Luckily he had a backup plan and arranged with the proprietors at Jolly Boys Backpackers, where he still works at no charge. But it was while negotiating for space at Jolly Boys Backpackers that he met the love of his life. A Norwegian volunteer named Silje Pedersen who was still a college student back home in Europe. “From the first time I saw her just sitting there it changed everything this was after I hadn’t been with a girl for 9. 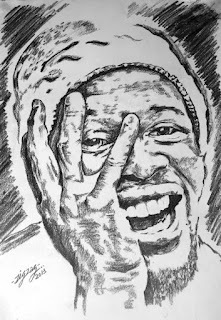 I met her hear in 2010, but she later left for Tanzania with her friends, and when I asked whether she will be back she said she didn’t know,” he affectionately recalls with an broad smile on his face “So I was forced to sell an artwork cheaply in order to follow her because I could stop thinking about her after she left. Like he left Lusaka, once again Zigzag found himself on a journey, a three day journey to be specific. This time all he had was an address, two bottles of water, two packets of biscuits and K2 loose change. Afraid to lose his sweetheart, he embarked on the journey to search for her. “ It was the first time for me to travel for a woman in life, then I saw her and it was nice just like the first time a saw her again we spent about a month in Tanzania getting to know each other more but things didn’t worked out then I came back to Zambia” he says. She too came back to Zambia and stayed here for some social work with YWCA for 4 months. 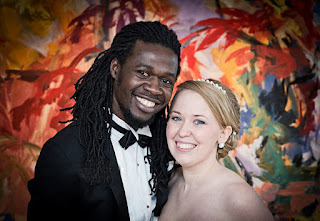 But a few months later they would patch things up and head to Norway for a colourful wedding. 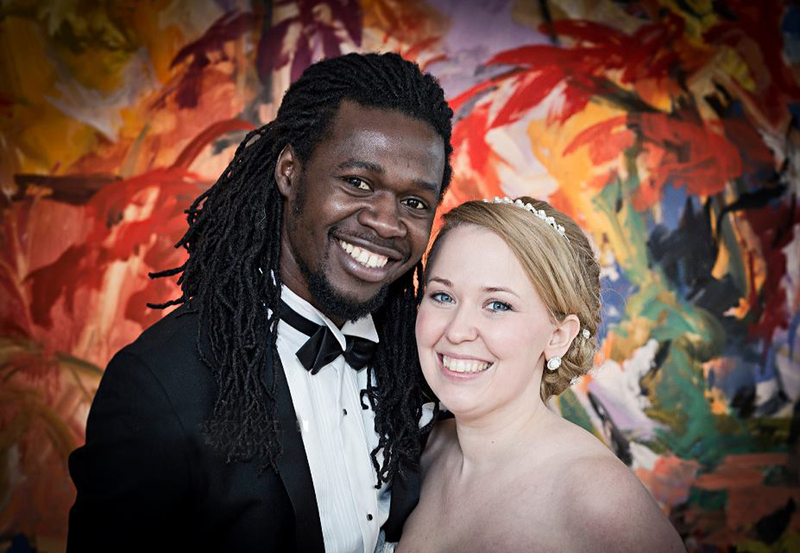 He came back to Zambia while she had to take up work in Norway. But today, they are expecting their first child and he has briefly abandoned his post at the Jolly Boys Backpackers to be by her side during this blissful moment in the young couples lives. Don’t worry be happy – Kopeka’s "art populaire"
A week before the much hyped 20th UNWTO (2013) general assembly artists and craftsmen – both government and self-sponsored – from all across the country thronged Livingstone and worked around the clock anticipating the estimated 5,000 (five thousand) delegates between the twin venues of Victoria Falls Town in Zimbabwe and Livingstone in Zambia to disembark from aeroplanes with sack loads of money to buy every trinket that they had to offer. However, not everyone was excited at the rumoured prospects. 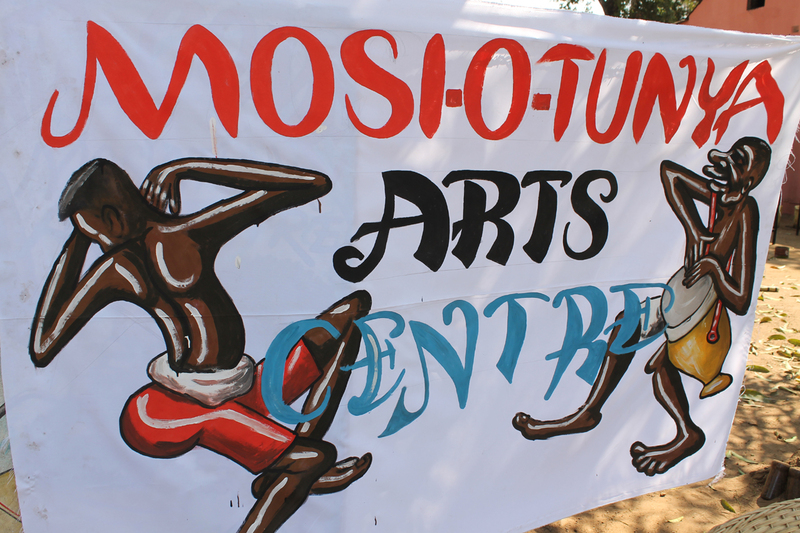 Bernard Kopeka, a 49-year-old artist who is one of five that run the Mosi-Oa-Tunya Art Centre could not be bothered by neither the panic nor hysteria brought about by this international event, for him, it was business as usual. “Yes I am looking forward to the UNWTO, but what I know is that we have been artists all along even before the UNWTO we were artists. Yes maybe they (delegates and tourists) will buy our work but the idea is just to work as we usually do, if we get sales then that will be a bonus,” says Kopeka as he applies some final coats of PVA house paint to the portrait of an elephant. He uses this kind of paint because unlike the professional paints used by contemporary artists, it is inexpensive and also easier to come by. Of course this does make his work lower in price, not to say that the influential American abstract expressionist Jackson Pollock used house paints straight from the tin but his works cost a fortune even before his death, but such is the irony of art. Kopeka paints on large format, stretched canvases making his works that average two metres in height visible from the main road, the Mosi-Oa-Tunya highway, these along with some anatomically inaccurate sculptures – that are so unattractive one wishes there was a law against such art – easily catch the eyes of passers-by, luring them into the art centre. Nevertheless, Kopeka is not responsible for the unsightly statues; it is one of the four friends with whom he runs the centre. 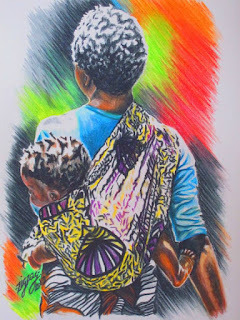 He is a painter through and through having picked up the trade from a cousin as a young boy in his home village in Mpulungu District in the early 1970s just before he dropped out of school in Grade 7. 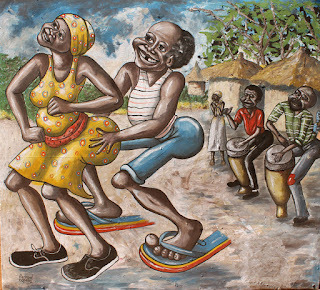 In his early days, he started out drawing cartoon strips on any paper he could lay his hands on but later developed his skill into painting when he migrated to the Copperbelt. “In 1987 I left the village and went to Ndola, there I found an artist who started coaching me in Chifubu Township near Fibobe Primary School, that’s when I met Mr Rodgers Mushinki who was an artist with ZCBC departmental stores,” he explains. 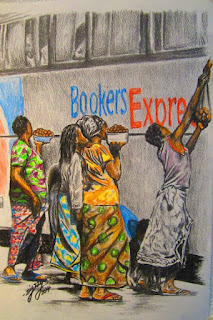 Kopeka would work under Mushinki’s apprenticeship for the next five years until the road beckoned once again and he decided to migrate to Zambia’s tourist capital in 1992 after a lot of encouragement from folks who saw his work and advised him that Livingstone is where the money is because of the many art and crafts collecting tourists that visit the city. But when he got to Livingstone, the beginning was not as smooth as he anticipated. Sales were slow and the fact that he married shortly after demanded for a larger income compelling him to seek employment as a ‘Chigayo Boy’ or hammer mill operator. However, Kopeka did not last long at the hammer mill, his creative vocation continued to call and he found himself quitting work to take up painting as a full time occupation once again. This time he was even able to make his former monthly earnings in two days. “Ever since I got married there is nothing else that I do. 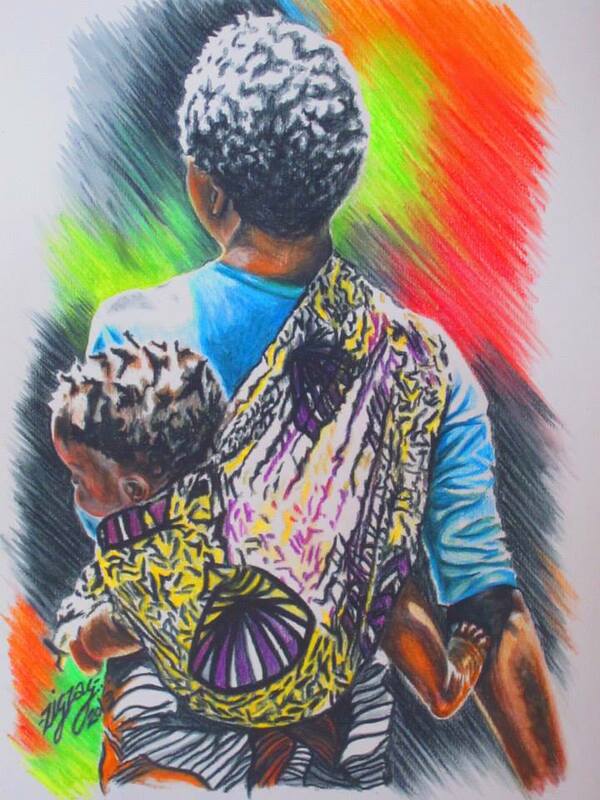 It is just art, sometimes I don’t sell anything for a month and we end up doing some sign writing jobs here and there, or even the small wall hangings keep us going because they only cost K50 (fifty Kwacha),” explains the artist who now has four children, the first born being an eighteen year old. He openly cherishes the support that he now gets from his wife who has set up a small cross boarder trading business that allows her to operate a market stall whenever she returns from Zimbabwe to order goods. But, although in 1992 Kopeka spent time learning new techniques with the acclaimed painter Vincent Maonde who was running an art club at the Livingstone Museum at the time, Kopeka’s work is still considered art populaire (folk art) as the Congolese would call it. 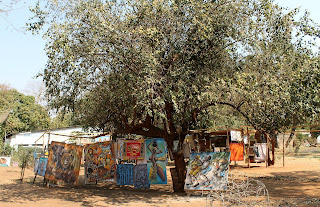 Not only because it is sold like a commodity in the open air which qualifies it to be called Jua Kali (hot sun) as the Swahilis will say, referring to the place where it is manufactured but because of the seemingly repetitive and almost identical subject matter the work possesses. 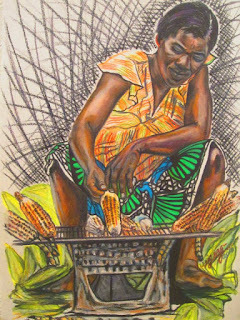 Artists such as Maonde with their Evelyn Hone training in the 1970’s and further exposure in the United Kingdom and the United States practice contemporary art in the western idiom, producing what is often termed as “high art” because it is sold mainly in galleries and on commission. 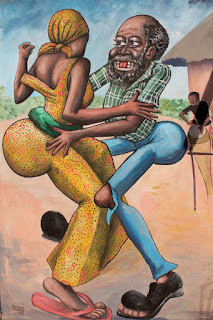 “I have come to learn in my years as an artist, that even the environment in which we sell our art determines the final price of our work,” says Kopeka “Someone will look around our ‘gallery’ and say ‘no reduce the price, I can’t buy it for this price’, even when he likes the work,” his large paintings go for anything between K1,000 (one thousand kwacha) to K2,000 (two thousand kwacha). 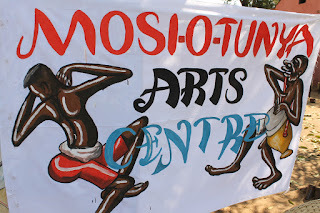 As the UNWTO drew to a close, sales at the Mosi-Oa-Tunya Art Centre were still very low but Kopeka could not be bothered, he was still in the jovial spirit that is reflected in the colourful outbursts reflected in the caricatures of carefree, dancing villagers in his paintings with aptly titled labels as Don’t Worry Be Happy and Good Times. It is business as usual. 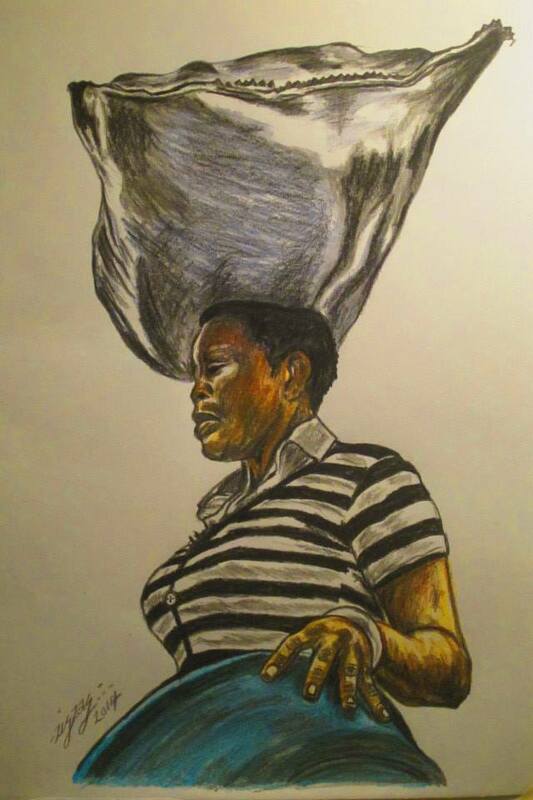 With what can be identified as an increasing demand for modern and contemporary African art on the world stage, South African artist and educator Annette Loubser suggests that if the continent is to benefit more from this wave, there is need to intensify research and writing on individual artists. This was while addressing the audience during the opening of Signs of The Times, a group exhibition at Galerie NOKO in Port Elizabeth that opened on 28 February and features photography, sculpture, painting and ceramics by Monique Willfen Rorke, Qhama Maswana, Chantall Berise Martin, Mziwoxolo Makalima, Brunn Kramer, Christian Arnold, Dorothy Barnes, Lee Hensberg and Suyabonga Ngaki. Loubser -- formerly a senior educator of the Iziko art collections at the National Gallery in Cape Town stated that while South Africa, Nigeria, Kenya and Morocco are essentially seen as the countries with the best infrastructure for the growing art market; it is still important that more research and writing is encouraged as she pointed out a few indicators that were necessary to harness this global demand as well as continue to ascribe financial value to the works of artists. Loubser suggested that there are three indicators that have been looked at by some contemporary art galleries. The first being publications, the second being the amount of art criticism and research that has been done around a particular artist, and the third thing is whether the artist has been given a one-person exhibition in a gallery or an art museum. Concerning the issue of research, she suggested this was of the utmost importance, and that it really needed to be encouraged pointing out collections such as The Contemporary South African Black Art Collection or the The De Beers Centenary Collection at the University of Fort Hare, the oldest black university in the country, founded in 1916. These collections which include works of icons such as George Pemba, Gerald Sekoto and Dumile Feni also house a wide range of disciplines such as etchings, woodcuts, wood blocks, linocuts, serigraphs, drawings, paintings and sculpture representing more than 170 artists most of whom have not been researched on in depth. Also within the Eastern Cape, she made mention of the Nelson Mandela Metropolitan Art Museum, which houses work by Gladys Mgudlandlu whose solo exhibition in Johannesburg in the early 1960s was reported as the first for a black African woman during the apartheid era. Loubser stated not enough has been written about Mgudlandlu and the work by others in the museum and that there is much that upcoming researchers could work with despite the sometimes restrictive nature of these institutions in terms of their archive accessibility more so the Fort Hare collection. Asked how she thought countries such as Zambia which may not have the infrastructure of the countries she earlier mentioned would benefit from a piece of the global pie concerning the demand for contemporary African art, she suggested partnerships in terms of exhibitions and research projects within the SADC region would be beneficial to start with. This unprecedented demand for modern and contemporary art from Africa is reflected not only by the likes of Bonham’s as Loubser points out in May last year Sotheby’s London held an inaugural sale for its Modern and Contemporary African Art department, with 115 works selling for a total of $3.6 million. This year a long-lost Nigerian masterpiece by Ben Enwonu that was found in a London apartment set a record for Bonham’s at $1.67 million during Africa Now, the first-ever evening sale of contemporary African art at the auction house and collectors are also discovering works through ever growing fairs such as 1:54 Contemporary African Art Fair, in London, New York and Marrakech.